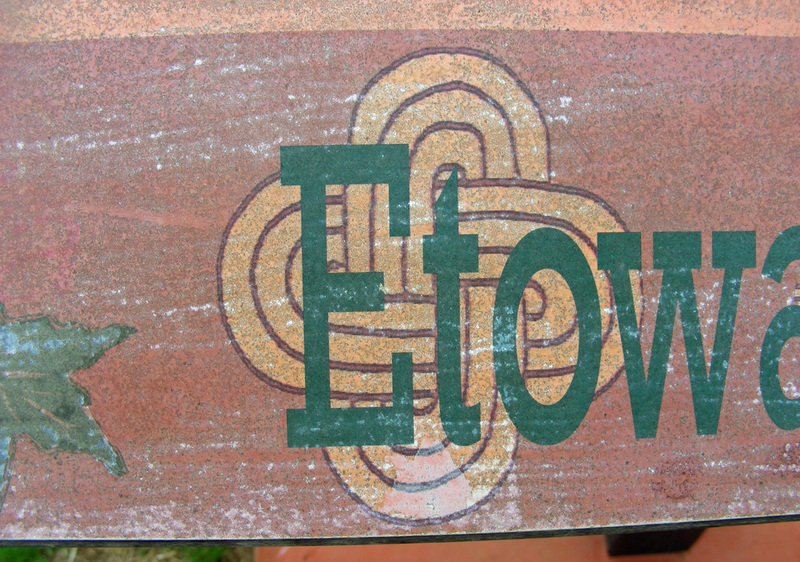 The origin and translation of the Native American word, " etowah"
her home in North Georgia"
and "the river in that area"
​Etowah, formerly called Money, is named after the Etowah River in north Georgia. Margaret Indiana Stewart Gash chose this name when the railroad company asked her and Joseph for a new name to replace "Money." The Gash's had donated the land for the station. The Etowah River runs through the part of Georgia near the Stewart plantation farm, Margaret's childhood home and the place where she married Joseph in 1871. Lenoir Ray tells the story in his 1970 book, "Postmarks," pg. 301. Most likely, Ray based his account on daughter Pearl Gillie Gash's 1956 hand-written account, "History of Etowah P.O." Read a full transcription. More about the Etowah River and translation, see below.
" The railroads were most particular about the names they put on their depots and Warren McNeely had no intention of naming this station "Money." The newly appointed station agent was J. Lee Gash. Mr. Gash had owned the property through which the railroad passed and on which the station was built. Mr. McNeely asked the Gash family to think of a name and Mrs. Gash, thinking of her home in North Georgia (near Calhoun) suggested the Indian name of the river in that area - Etowah. The railroad approved and the name of the station in 1895 was Etowah. In 1898, the Post Office Department changed the name of the office to conform, and the community was on its way. " Left & Right: Pictures of Margaret and Joseph taken in May 1871, three months after their marriage on February 14, Valentines Day. 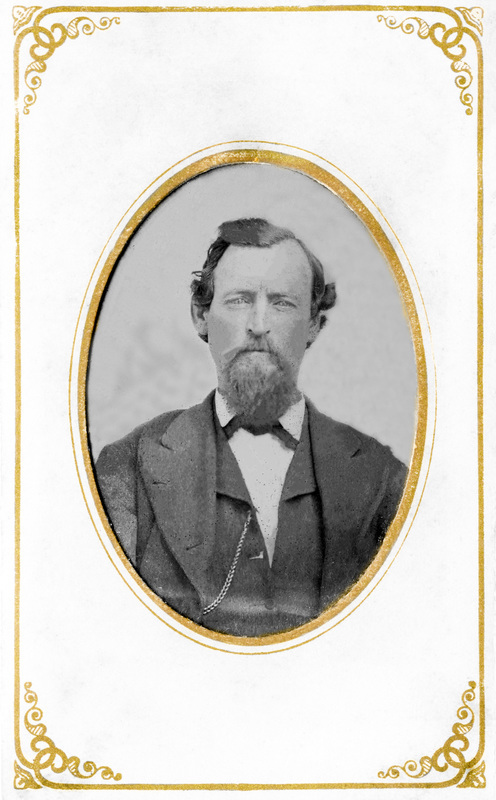 At about age 27, Joseph, a Henderson County native, was living in Georgia prior to the beginning of the Civil War. He is listed in the 1860 Georgia Census with the Anderson household, of Margaret's married sister. In 1865 he was appointed postmaster of Adairsville, Bartow County, GA. Joseph and Margaret were married in 1871 at her mother's home. 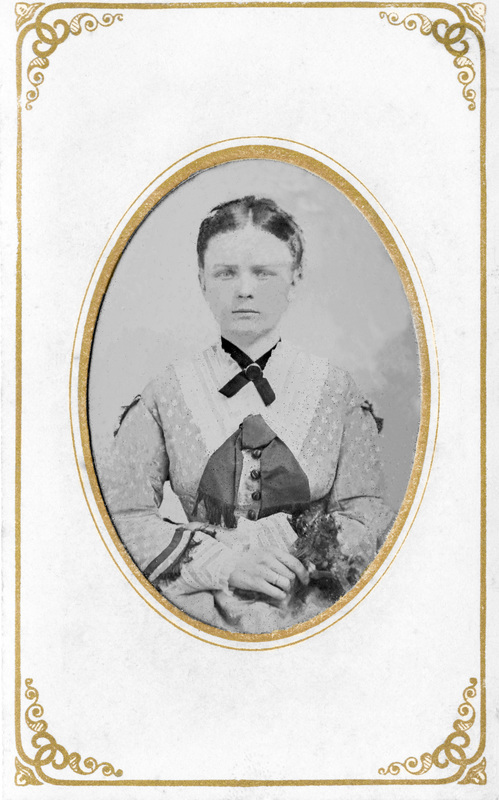 They had three children before moving to Henderson County, sometime between 1878-1880. ​Joseph is also remembered for helping to establish the Etowah Presbyterian Church, 1894.
history of the Etowah Presbyterian Church, Joseph Leander Gash purchased land from Noah Henry (son of Joseph Henry) which he then donated for the re-location of the Presbyterian Church. ​At the time, the Church was named Midway because it was located midway between Mills River and Davidson River Presbyterian Churches. 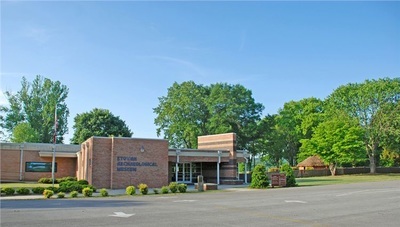 ​Etowah is the only traditional community in Henderson County with a Native American name. Of what origin? 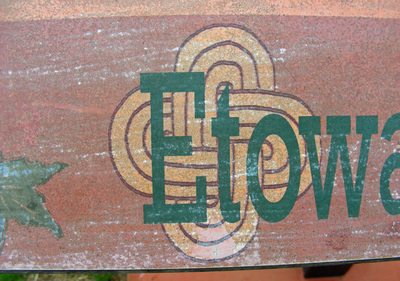 And what does the word "etowah" mean? The Etowah River is just west of Lake Sidney Lanier. 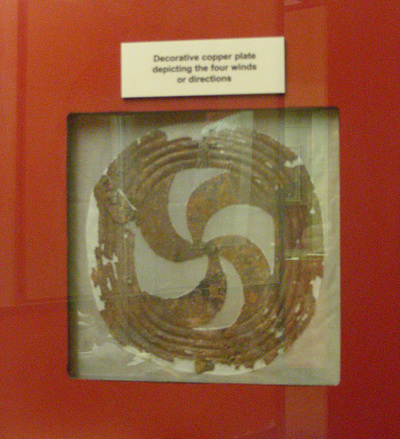 Translation: " tribal town "
- from the Introduction of the "Dictionary"
"Four hundred years ago a single language was shared among a large number of towns along the Coosa, Tallapoosa, Alabama, Chattohoochee, and Flint rivers of Alabama and Georgia. It was the most widely spokien language in the region, used for diplomacy, medicine, and personal names even in towns where other languages were used for every day speech. 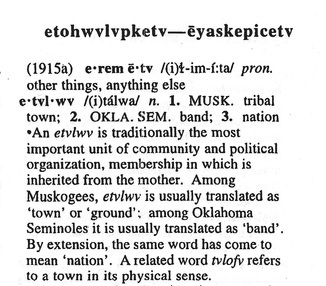 The language the townspeople shared came to be known as Este Maskoke em opunvkv, or the language of the Muskogee people. Creek is a member of the Muskogean family, one of five language families indigenous to the Southeastern United States." The Etowah Indian Mounds Historic Site, adjacent to the Etowah River is located outside of Cartersville, Georga in Bartow County. From the website: "Home to several thousand Native Americans from 1000 A.D. to 1550 A.D., this 54-acre site protects six earthen mounds, a plaza, village site, borrow pits and defensive ditch. 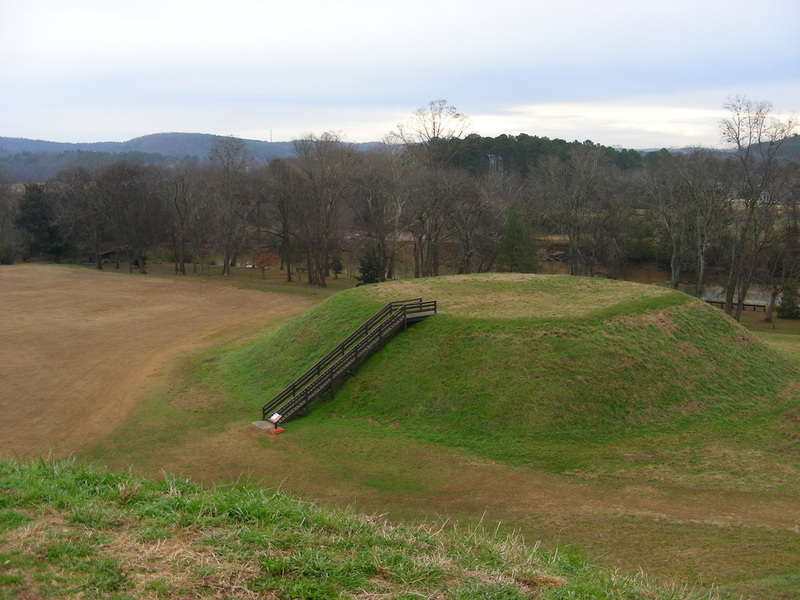 Etowah Mounds is the most intact Mississippian Culture site in the Southeast. "